To address a user request I just quickly wrote a new utility function, describe.simmap, to summary the results from stochastic maps on one or multiple trees. It computes the total number of transitions and the number of each type (using countSimmap; and it computes the posterior probabilities for each node. 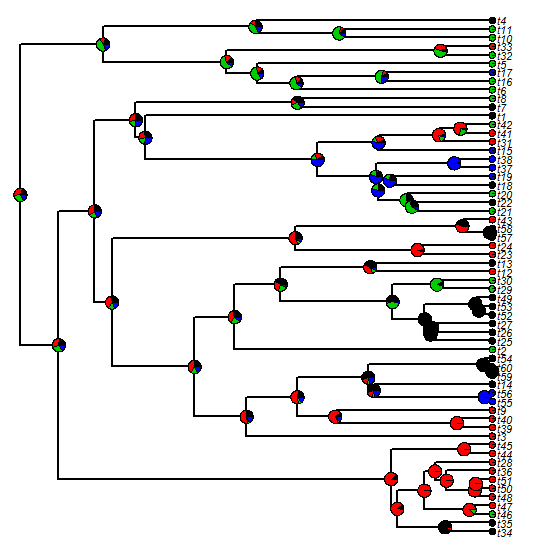 Finally it can optionally plot those probabilities on a tree. Basically, it pulls together some different things that I've been doing for analyses and visualization in some recent posts (e.g., 1, 2, 3, 4, 5, 6). Code is here. There was a small bug in this - fixed here.